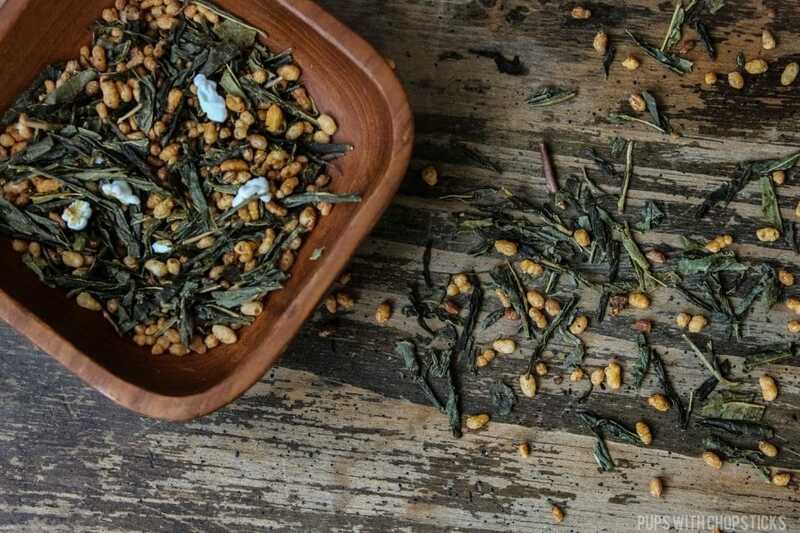 Tea made from Genmaicha is most commonly referred to as popcorn tea from it’s popcorn flavour thanks to the roasted popped brown rice mixed into the green tea leaves. As tea! 🙂 Generally, we just steep the leaves and make tea out of it, however there are times I have actually use this in brines and marinades as well but the process still involves it being steeped into a brine or marinade. They come in tea bags or in loose leaf. I personally prefer using loose leaf because you have a bit more control on how strong you want your tea by putting in the amount you need. You can find genmaicha at Asian tea stores and Asian supermarkets. Now that tea is getting more and more popular you can almost always find them at almost all tea stores as well. Tea made from Genmaicha has a nutty flavour that tastes like you’re drinking a popcorn flavour tea. The popcorn flavour comes from the roasted brown rice. During the roasting process, the rice will occasionally get ‘popped’ and produces little white fluffy bits that actually look like popcorn! Store teas in a air tight container away from sunlight in a cool dark place. genmaicha is one of my favorite teas! it’s perfect when i want something heartier than plain green tea. i was working for a startup who had space in a venture capitalist firm last summer, and the best perk was easily all the teas they had for us. i think i single handedly decimated a large jar of genmaicha over a couple of months. oops. that’s hilarious. It’s almost like water to us eh? That is definitely my default go-to tea all year round.